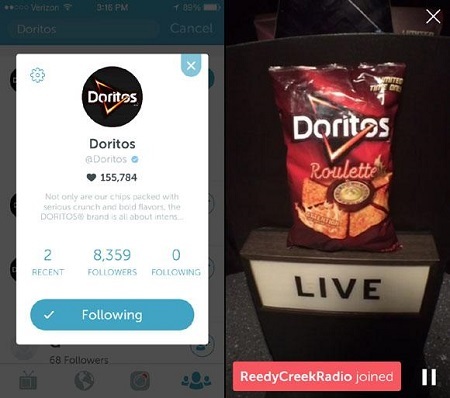 •	Brand created a live-streamed game coordinated across Twitter, Vine, and Periscope. First rolled out in Mexico and now available worldwide, Doritos Roulette bags have a combination of traditional nacho cheese chips along with one extremely hot chip per handful. The chips are coloured the same, meaning biting into the spicy chip will take consumers by surprise, making it the perfect product for Doritos to have fun with on social media and mobile. As part of the #DoritosRoulette campaign the brand created a live-streamed game coordinated across Twitter, Vine, and Periscope. The contestants were chosen at random (out of the viewers on Periscope) and given prizes depending on where the spinning wheel landed. The contest included online games of chance, a live giveaway styled like a gameshow, and many opportunities to win prizes—after tagging at least three social media friends. The campaign spanned across multiple social media channels with the team game on Twitter, winner announcements on Vine, promo images on social accounts and video advertisements on YouTube. The challenge format of the campaign entices the male demographic while younger consumers are accessed through the social and mobile platforms. Ultimately, the contest helped create massive exposure for the new product launch. A number of customers tried the new chip as a result of the company’s promotional efforts and said it was delicious (although many of these same testers disagreed on the level of spiciness Doritos promised).